This dance from Ottawa was devised to celebrate a workshop – for Eileen Black’s organisation of the Jones Falls Weekend Workshops for 25 years on behalf of the RSCDS Ottawa Branch. (Charlie also devised The Cape Breton Hornpipe and George Watson of Tipperlinn, which is included on Coast to Coast with Scotch Mist .) Jones Falls Dam is a dam on the Rideau Canal located in Rideau Lakes, Leeds and Grenville United Counties, Ontario, that was built to tame the mile-long series of rapids and falls that runs through the Jones Falls. The dam was built by John Redpath and Thomas McKay and when completed in 1832 was the largest dam in North America and the British Empire. At Jones Falls, boats rise and fall almost 60 feet via a set of four canal locks, and the dam, nicknamed the Whispering Dam, is approximately 360 feet long, 60 feet (18 m) high and 27 feet (8 m) thick at the base. It was built with large sandstone blocks that were quarried approximately 2.5 miles inland from the north end of the lake, near Elgin, Ontario, hauled by oxen to a landing, then moved by scow to the dam site and shaped there. No mortar or cement was used in the construction of Jones Falls Dam. The blocks were set in a giant arch, with the pressure of the water behind the dam pushing the perfectly dressed blocks together, like an arch used in building structures. It is called the ‘Whispering Dam’ because if a person stands at one edge of the dam, near the top, and another person stands at the other edge, the two can communicate quite well over a distance of almost 360 feet (110 m). This is because of the shape of the dam in an arch with no mortar. 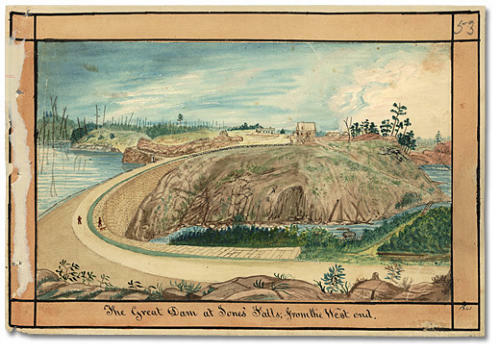 At the peak of construction, 260 men worked at the Jones Falls site: 40 of them were stonemasons needed to cut and dress the quarried sandstone blocks. Malaria hit the workforce hard in the summer of 1828 and subsequent years, killing dozens and disabling most of the others for weeks at a time.